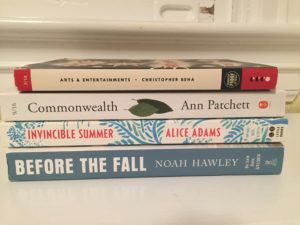 I was fortunate enough to be one of the many people who crammed into Politics and Prose last month to hear Michelle Brafman talk about her new book, Bertrand Court. (Yesterday was the EDIWTB online book club for Bertrand Court.) Here’s what Brafman had to say. 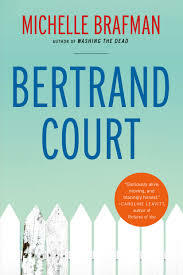 Bertrand Court is a book defined by “random assignments”. Life is “one long cul de sac”, like Bertrand Court, and the characters of the book are connected in random ways like on this street. (She calls this “cul de sac lit”). She wanted to show a different side of DC, one made up of the people who work for the famous people. Bertrand Court is named for Bertrand Farkas, an Emmy award winning producer who had a distinctive style that conveyed a sense of eavesdropping. He was very good at establishing time and place. The book doesn’t necessarily have a plot, but it has an arc. It covers from babies to death. She wanted to explore “the glorious messiness of connectivity”, with stories told by characters who are in the hot seat, behaving badly. She found it fascinating to write the same thing from different perspectives. She kept writing stories she had from different points of view, revealing where the characters were based on their perspective. The characters in Bertrand Court are messy and inconsistent from story to story. It’s a book about connection but also about how hard it is to accept the cul-de-sac-ing in other people. Did you picture the book graphically? Yes, I did. But I didn’t end up doing it on paper. Jewish themes are big in your books. Do they play a big role here? Yes, there are a lot of Jewish people here – not all. Some are interfaith. The first story is based on a Jewish folk tale. But this is not like Washing The Dead – this is more of a secular book. Were some characters easier to write than others? Not really, because I was always so compelled to write the next story. The men were so easy to write, as they were so far from my experience. This book was written over the course of 15 years. Why so long? I did a lot of backstitching, weaving back into the book. When did you know it was done? Did you have an end in mind? I always knew the last story would go at the end. I fudged around with the order of the other pieces. Which was the last story you wrote? “Two Truths and a Lie”. Did you know the stories would be linked? I wrote them in triptychs – groups of three. I wanted to tell the conflict from three perspectives, but have it all belong to the same world. How you know when a sentence is done? You’ve written a novel and novelistic stories. Which do you feel more comfortable with? I prefer writing a novel. When I wrote these, I felt like I was working toward the novel. Would you like to revisit these characters 10 years later? I hadn’t thought of that, but it would be fun. I am finally going on vacation this week, which I am really looking forward to. 8 days in Italy, with hopefully enough downtime to read some books. Here is what I am bringing with me to read. 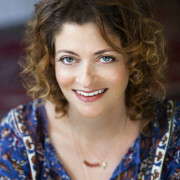 My friend Nicole Bonia of Linus’s Blanket and I have started a podcast for Readerly magazine. Here is the first episode. It’s not on iTunes yet, but I will share the link when it’s up. 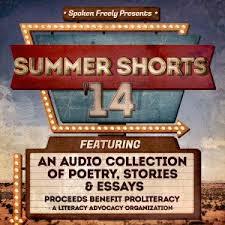 For now, you can listen at the Readerly site. We talk about what we’re reading, what’s coming out soon, and what you might have missed this summer. Give it a listen! We’re recording another show today. Parkhurst has a son on the autism spectrum. She made Tilly a girl so that there would be differences between her son and Tilly. Pop culture informs her writing a lot. She told Alexandra’s perspective in the second person so that the reader could be closer to her and understand what is going on in her head She wanted those chapters to feel more intimate, so that the reader would viscerally feel the chaos in her life. Harmony was the most difficult book she has written and took the longest to write, in part because it was the most personal. She worried whether it was OK to be writing about her kids. She is still not sure whether she got Tilly’s voice right. Her son’s mind is incredible, unlike anyone’s she has ever met. She wanted Tilly to be unique too and had to create that voice for her. Scott was the hardest character to write. He says the right things and makes sense on the surface. He is not based on anyone she knows, though she spent a lot of time thinking about cults when she wrote him. She has ideas for her next book but is not writing anything right now. I also enjoyed this Wall Street Journal post about Parkhurst’s son reading Harmony. I’ll be offline for the next two weeks or so but hope to have a few reviews to post when I get back! Happy August, everyone. 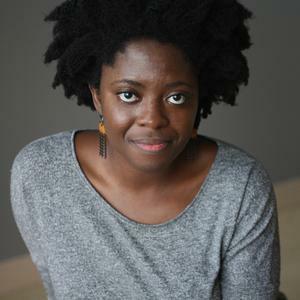 Here is what she had to say about Homegoing and her writing process. Q: What was the inspiration for writing the novel? A: I went to visit Cape Coast Castle in Ghana in 2009 on a grant from Stanford. The inspiration for the book was instantaneous once I got there. I knew that’s what the book would center around. British soldiers would marry local woman and live upstairs, and slaves were kept in the dungeons below. The castle is majestic and beautiful, contrasted with what was going on downstairs. Q: Did you feel the weight of a spiritual presence there? A. Yes. The place is haunted. How many people died there? They had no light, air or food. Q: Your book focuses on the experience of women. A: It is very hard to erase the pain of these people’s lives. Very little has been done to make amends for what they went through. When you go there, you feel grief and rage. How could this have happened for so many hundreds of years? Q: Homegoing is not a bitter novel. Were you conscious of the emotional demands you were making on your readers? A: I did not want to ascribe blame. I wanted to show the complexity of the situation. There are no villains or heroes here; it’s a nuanced representation of how people came to evil circumstances. Q: Do we all bear responsibility? A: Yes, you’d have to wonder what would have happened if ethnic groups in Africa had banded together and fought back? We all had responsibility for stopping it before we did. Q: What research did you do for Homegoing? How did you pick the Ashanti tribe? How did you establish the chronology for the book? A: I picked the Ashanti tribe because they were central, inland and incredibly powerful. They were feared by both English and Africans. They won a lot of wars against the British. The Fanti are coastal, and would also sell people to the British. The two tribes would invade each other’s villages and sell the captives. I wrote chronologically, and would research what was going on in the background so that I could put it in the book. I didn’t want the book to feel stuffed with research. Q: The book has one storyline in Africa and one in America, with 14 characters across separate sections. A: I knew I wantd the book to end in the present tense, talking about the African-American experience. I made as many pitstops in between as possible. I needed it to cohere. Q: Did you think of the different chapters as short stories? A: No. The book always felt novelistic in scope. It felt complete and holistic. The chapters can be read separately but the point is what they all look like together. Q: Did you ever second guess this structure and feel like you needed to write it in a more traditional way? A: I started it in a more traditional way, but it wasn’t working. This structure suited me better. Q You have a lot of different cultures in this book. A: I grew up between cultures. I didn’t feel Ghanaian or African-American enough. This is the physical manifestation of straddling two worlds. I wouldn’t have written the book if I hadn’t been born in Ghana and grown up in Alabama. Q: Who are your literary inspirations/heroes? A: Toni Morrison – Song of Solomon totally got me started. Edward Jones. Jhumpa Lahiri. Q: This is a story of disruption, where so much is lost. But there is hope too. A: Diaspora is hugely important to me. My sense of self, racially, was confused. I was cut off from African culture and left for college asking a lot about diaspora. My trip to Ghana was a chance to connect with my own roots. The slave trade fractured families so completely. What did that mean for the future and our legacy? 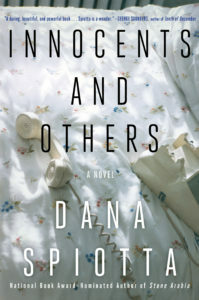 Dana Spiotta’s Innocents and Others is a hot book these days, so I thought I’d give it a try and grabbed it from the library. It’s the story of three women: Meadow and Carrie – both filmmakers, who were best friends growing up in LA – and Jelly, a woman living in upstate New York who contacted powerful men in Hollywood as a hobby and engaged in longterm phone relationships with them under an assumed name. (Jelly is based on a real-life woman named Miranda Grosvenor (not her real name) who engaged in similar catfishing of famous men.) Innocents and Others tracks Meadow and Carrie’s careers and friendship, and weaves in Jelly’s story so that it intersects with Meadow’s as well. -An exploration of the responsibility of a filmmaker to pass judgment on her subject (or at least acknowledge wrongdoing). Is it wrong, for example, for a documentarian to focus on the perpetrators of massive crimes against humanity (Argentine executioners who adopted the children of their victims) rather than on the victims, to try to understand who they were? I mostly enjoyed reading Innocents and Others, but it’s also one of those books that made me feel like I wasn’t smart enough to really get it. Maybe it was the passages about the history of cinema or the mechanics of filmmaking – those are not areas I know a lot about and I ended up skimming a fair amount of them. But I did enjoy the rest of it. I like Spiotta’s writing – a little detached but wonderfully detailed about the things that matter. Unsurprisingly, I enjoyed the parts about friendship and connection more than those about filmmaking. -What does she like about writing? Having questions and trying to figure them out through writing. Just like reading, writing brings joy when you feel the self go away and you can imagine other experiences and have connections, even if you’re making them yourself. –Innocents and Others is full of connections and discovery through the imaginary and the observational. -Jelly, Meadow and Claire are all strange women. Reading fiction can make our own experiences more clear (?). -Spiotta is interested in outdated technologies, like landlines. How funny that you would pick up the phone and there would be a stranger there! We hate the phone now – there is something intimate and intrusive about being called on the phone rather than being texted. Using landlines in the book established a “slight location to the recent past” so that we could see it more clearly and precisely. –Innocents and Others also follows the theme of listening vs looking (phone vs film). Spiotta wanted to explore “the tyranny of the visual”, where what you’re saying doesn’t matter, but what you’re seeing that wins out. The power of the image overrides other senses. -About the three plots in the book: Spiotta knew the stories would intersect, she just wasn’t sure when. She doesn’t like to write in a big line; she jumps from thing to thing as she’s going through. The rhythm of the novel comes from switching the stories around. A few days ago, I reviewed Hilary Liftin’s new novel, Movie Star By Lizzie Pepper. Hilary was gracious enough to answer some questions I had for her about writing the book. Q: How much of your affinity for writing can you attribute to your role as Features Editor of The Discus (our high school newspaper)? HL: Well, all I can really say is that it was when working for The Discus that I first began to understand that nobody thinks I’m as funny as I think I am. Q: I read that you knew nothing about writing fiction before Movie Star By Lizzie Pepper. How hard was it to develop the plot structure and the pacing of the novel without having done it before? HL: I had never tried my hand at fiction, but I read enough (and was an English major, etc.) so at least I had a sense of what I wanted to achieve. Also, when I ghostwrite memoirs, I’m always thinking about the narrative structure and pacing–it’s just that I’m limited by the real stories and timeline of my clients’ lives. So in part I relished the freedoms of fiction–I could create a story to live up to my ideals. On the other hand, I had to create it. That was the part that was most new to me. I’m used to writing celebrity books on a tight deadline. I had to slow down and try to develop the skill of actually having ideas out of thin air. It’s a muscle I haven’t exercised much. Q: You and I share a love of candy. What do you eat while you’re writing? HL: I wrote most of this book at the charming chain restaurant, Le Pain Quotidien, where I could drink green tea refills punctuated with obscene helpings of their proprietary version of Nutella. Which is basically candy. Q: Do you have a preference between writing fiction and non-fiction? HL: The non-fiction books I do are more fun and in some way less challenging because, as I suggested above, the material is mostly handed to me. They are easier and I pretty much have endless energy for them. Fiction is more grueling for me, but having freedom and control — and being involved through publication — has been fun in a different way. I just don’t think I could ever be as prolific at fiction, but it’s been a very exciting shift. Q: (spoiler ahead) I thought the saddest part of Movie Star By Lizzie Pepper was when Lizzie found Emil’s scripts in Rob’s office. Did you base that element of the story on something you’d read elsewhere, or was that your creation? HL: That element of the story has no basis in fact. In fact, I have to say that even though it’s one of my favorite parts of the book, the idea actually came from a friend of mine, Esta, who thought of it for me in a spin class. What a gift that was! As a professional collaborator, I have no shame in sharing the credit where it’s due! All writers should have friends like Esta. Or we should all spin. Q: How do you think Movie Star by Lizzie Pepper would have been received if Tom Cruise had never married Katie Holmes? Do we as readers need to project this story onto real life people that we can picture or is a good story a good story regardless of its origin? HL: If we weren’t fascinated with celebrity culture in general, I never would have written this book. It’s fiction–I don’t think we need to feel like this is or is meant to represent actual people–but so much of it is about fame, how it looks from the outside versus how it feels from the inside, that I think you have to have some level of curiosity about that notion to get drawn into the book. Q: I love that Stevie Nicks is one of your dream ghostwriting clients. I think those rock stars approaching their 60s must have incredible stories to tell. (I decided I needed to write a book about a reuniting girls’ rock band after seeing the Go-Gos in concert last summer). Who else’s memoir would you like to pen? HL: There are a few older stars whom I don’t think have done books–Barbra Streisand! Bruce Springsteen!–and of course there’s Caitlyn Jenner. I’m really open to anyone who has a story with interesting turns that have never been fully explained. Q: Talk about your writing process. Lots of drafts? Or do you get it right the first time? How much did you cut out before the book was finished? HL: I threw away chunks that weren’t working as I went–it’s hard to say how much, I don’t know, sixty pages? I’m also a big editor. I move and add whole chapters, paragraphs, sentences. Thank God for word processing. My husband, who is also a writer, did a very heavy edit over a three-day weekend that was supposed to be half-vacation but ended up being all work. And, finally, I love tightening prose, and I did that endless times with this book. I was finding things I wanted to fix up until the very end. I wrote very apologetic letters to my editor and did everything I could to persuade her that I was sane. Q: Finally, when will you be in DC next and will you sign my book? HL: I don’t know when I’m next coming to DC! But I’d be delighted to send you a signed copy. I attended a Q&A with Jane Smiley at Politics & Prose earlier this fall, and since I just reviewed her new book Some Luck, I thought I’d post the Q&A now. Smiley calls Some Luck an “old person’s way of writing a novel” – with the years progressing evenly, as “happy and tragic events came and went”. Q: A lot has happened since you started writing. Has it affected your writing or could you have written the same book 20 years ago? A: I think so. I came up with this idea 5 years ago, decided on a setting, settled on Walter and Rosanna, gave the kids personalities, and set them on their way. The book is mostly made up of history and gossip. Q: A lot of your books have an agricultural motif. Have you lived on a farm? A: No, but I lived in Ames – what’s the difference? I moved to Iowa City at age 22. I was interested in farming, the ecology of farming in our lifetime. If I had gone to UVA, I would have gone down another path. Q: You used to teach. When you taught, did it affect your writing, and did your writing affect your teaching? A: Yes. Once I was writing a story, and teaching undergrads, and I was giving tips for storywriting and in the process came up with how to move on in the story. Q: Do you write thinking about how the book will sound out loud? Do you ever wish you’d changed a word? A: Yes, in fact I did tonight during my reading. Q: A Thousand Acres had King Lear as its background. Did anything inspire Some Luck? A: No, I just wanted to fill this title: A Hundred Years. This was much more free form. I knew where I was headed. I knew Frank would go to war and the farm would change and someone would stay on the farm. It had boundaries, but not structure like King Lear. Q: Some Luck is the first of a trilogy. Are the other two books finished? A: Yes. I need to fiddle with the last 5 years. Q: Which books influenced you as a girl? Little House on the Prairie? A: That series was read to me as a kid. The books that had the most influence on me were the ones I read as a 13-14 year old: Giants in the Earth, David Copperfield, The Web of Life. Here is a video of the reading.